All the Revit files will be removed from the main corporate website and there will be a direct link to the BIM site: this new space will be a pivotal centre on which everything relating to the BIM field will converge. BIM is highly topical at the moment and has stirred up widespread interest. We have been working for years now to acquire an in-depth knowledge in the area, in a quest to share it with all the stakeholders with whom we regularly work - academic institutions, designers and builders. A wealth of interesting information and new developments will be published on the website in the course of the year, including the CUBOROSSO BIM model, the online launch of an entire “standard” heating system and more large-scale projects which will directly involve some of Caleffi's manufacturing premises. 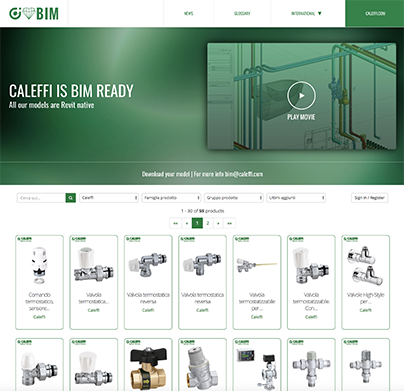 For any information or enquires, but especially for your welcome feedback, please get in touch with us at bim@caleffi.com. Caleffi new DYNAMICAL® valve is a simple way of controlling room temperature, limiting the flow of the carrier fluid and controlling the differential pressure at the radiator itself.